The winner's circle isn't only reserved for horses in the Bluegrass State. 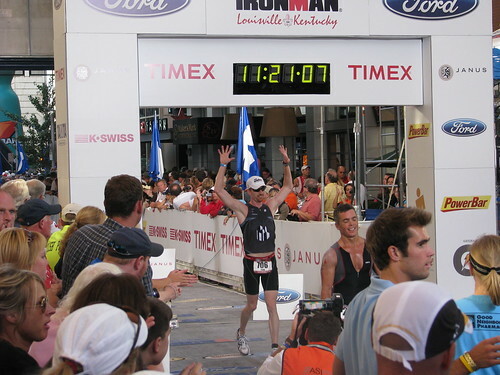 Louisville might be home to the Kentucky Derby but it's also host to one of the few Ironman events in the States with all the hype cooling off after the May event only to ramp up again come the end of August. Ironman Louisville was among one of the many endurance events taking place over the weekend--I only touched on a few last week, even accidentally omitting the infamous Hood to Coast relay--and for those participating it was all about getting lucky in Kentucky but not in the phrase's traditional connotation. Part of the reason to hold an Ironman event in Louisville in August is for the added challenge of battling the heat and humidity in addition to the distance and terrain. Take China's Ironman this April where the temps soared to 113 degrees, or Ironman Arizona when it was held in April left athletes struggling through scorching sunlight and intense winds (both events have since been moved to different times of the year). Typically Louisville is no exception with heavy rain producing fast currents in the Ohio River when the race was first held in 2007 and then intense heat--nearly equated to Kona proportions--last year. But 2009 was different, with projected highs only being in the 70s--I heard high of 75 on The Weather Channel as they rolled through the State Fair forecast. So at least from a weather standpoint you could say that triathletes were getting lucky in having a better-than-average race day. The other luck and hard work comes on the race course itself with the record-setting crowd--news posted online stated that nearly 3,000 athletes were registered to participate--competing for rights to boast Ironman completion and for one of the 64 age-group slots, 8 pro slots to October's World Championships. This weekend marked the last chance to nab a ticket to Kona in 2009--Ironman Wisconsin on September 13 marks the first chance to qualify for the 2010 Championships. Talk about an eclectic crowd--triathletes came from more than 20 countries and across North America to race in Louisville. If you check out the results, you'll see racers from Texas, Colorado, Indiana, California, Kansas, and Ohio just to name a few states. And maybe it's just my quick scan of other Ironman results but Ironman Lake Placid tends to have several racers from the East Coast, especially New York, and Ironman Wisconsin has a large concentration of athletes from Wisconsin and Illinois. And they were fast. The men and women professional winners, Viktor Zyemtsev and Nina Kraft, won in course record-setting time, and a record 2,345 triathletes finished the race. Some of the age groupers even bested the pros, finishing among the top 10 overall. While there weren't many Chicagoans competing, the bulk is tapering for Ironman Wisconsin, there were a few area athletes participating. There are probably more with Chicago connections, but one that stands out is D'Arcy Lynch who finished second among the 30- to 34-year-old women. The cool news with that story is that this year will mark Lynch's third trip to Kona--she first qualified at Ironman Wisconsin in 2006 and then scored a spot at last year's Ironman Louisville. Another standout is MJ Slikas, who won her 40-44 age group and also earned a return trip to the Big Island. Congrats! Hey Kate - thanks for the shout out! !